126 semifinal in Britt: Joel Haberman (C-G) pin over Mike Anderson (B-K) in 3:41. Slowing down with consolation matches now. 132 semifinal in Britt: Tanner Heaberlin (B-K) pin over Krister Beal (Lake Mills) in 1:17. 126 semifinal in Britt: Michael Olsen (Lake Mills) pin over JD Sliger (Central Springs) in 5:26. Ethan Blanchard of Central Springs up 3-2 agaisnt Calen Rosenbaum of Clarion-Goldfield in their 132 semi. 132 semifinal in Britt: Ethan Blanchard (Central Springs) over Claen Rosenbaum (C-G), 6-2. 285 semifinal in Britt: Mitch Gambrill (C-G) pin over Tommy Dalton (Central Springs) in 2:55. Finals matches in Britt. 106: Justin Portillo (Clarion-Goldfield) vs. Jeremiah Colon (Newman Catholic). 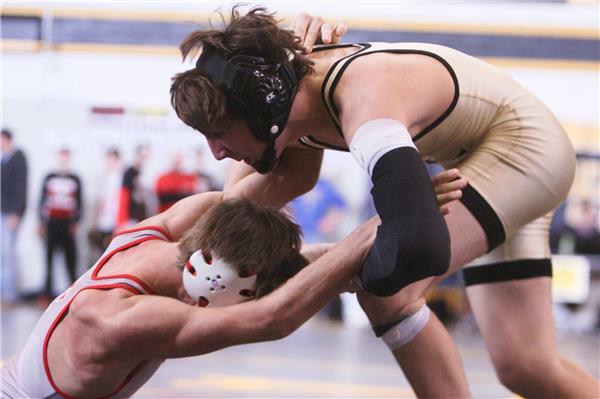 113: Josh Portillo (Clarion-Goldfield) vs. Marcus McDonough (Central Springs). 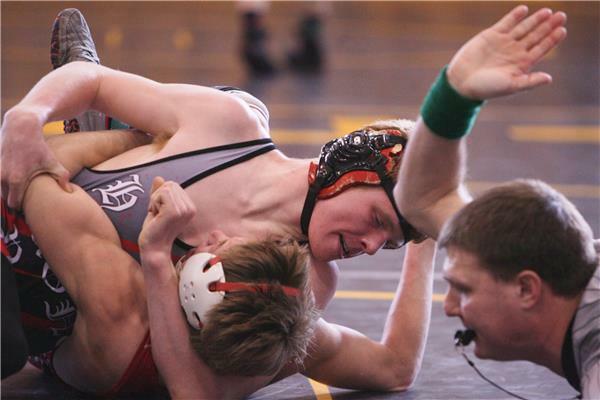 120: Zach Andrews (Belmond-Klemme) vs. Lucas Lienemann (Clarion-Goldfield). 126: Joel Haberman (Clarion-Goldfield) vs. Michael Olsen (Lake Mills). 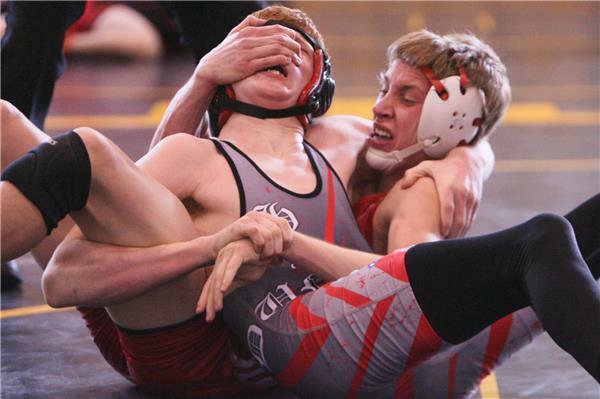 132: Tanner Heaberlin (Belmond-Klemme) vs. Ethan Blanchard (Central Springs). 195: Andrew Olsen (Lake Mills) vs. Colton Hansen (Newman Catholic). 220: Caleb Hansen (Clarion-Goldfield) vs. Tyler Mary (Lake Mills). 285: Luke Worden (Belmond-Klemme) vs. Mitch Gambrill (Clarion-Goldfield). Here we go. 106 finals match between Justin Portillo of Clarion-Goldfield and Jeremiah Colon of Neweman Catholic. Portillo is ranked second, Colon fourth.